I recently paid a visit to Wimpole Estate, 3,000 acres of parkland, which contains Wimpole Hall, the largest house in Cambridgeshire, along with a church, a farm and a walled garden, but I wasn’t there to see any of that, I had my sights set on the folly. This substantial pile of Grade II listed masonry was built in the 1770’s, and designed to resemble the ruins of a gothic castle. 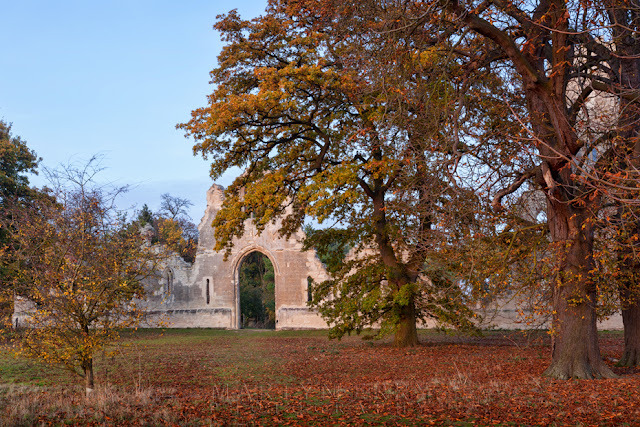 It was designed by Sanderson Miller, who was a noted follies architect of the day, and is probably best known for the Great Hall at Lacock Abbey, the place where William Fox Talbot created the earliest existing camera negative. The folly was actually built by Capability Brown several years later, when he ‘naturalised’ the parkland landscape in his inimitable style. I arrived in the late afternoon and made my way over to the Folly, stopping at various spots to admire and photograph the view. Thanks to the time of year, the trees were displaying their autumn coats and lit up the grounds in vibrant hues. 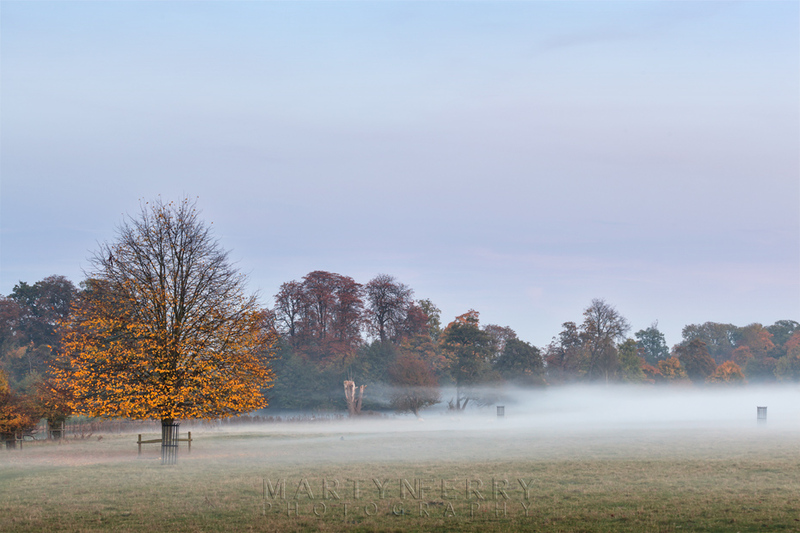 Unfortunately sunset was a non-event, there was practically no colour in the sky, but once dusk had settled, a thick carpet of mist began to creep and curl over the landscape, which resulted in some rather nice autumnal scenes. the page, simply click on it to enlarge. Beautiful autumn colours are reflected in one of the three interconnecting lakes. More autumnal hues gleam in the warm light. I stopped to get this shot once I was past the lakes and climbing the hill that the folly rests on. The light from the setting sun blushes the sides of the folly. Mock remains of the sham Gothic Tower. The last of the light illuminates colourful foliage. This bright yellow tree against the cool hues of the field caught my eye. As the sun set for the evening, mist started to accumulate around the trees. Looking over one of the belts of woodland that dot the park, as it becomes obscured by mist. Tendrils of mist reach out towards the trees that line the river. Looking towards the Hall in the last of the light. A view into the formal gardens.